The IDF hit more than 100 targets in Gaza on Tuesday, half of them rocket launching cells. Twenty-two percent of Tuesday’s strikes hit rocket launchers that were not manned at the time. Another 8 percent of strikes targeted smuggling tunnels. Four percent targeted weapons stockpiles, 3 percent were aimed at terrorist groups’ infrastructure, and 12 percent hit other targets. 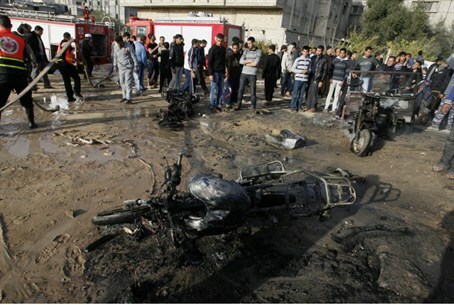 In what appears to have been Tuesday’s most deadly strike, IAF planes hit a weapons convoy in Gaza City. Strikes on two vehicles carrying bombs set off secondary explosions in which six people were killed. According to local media, two of the victims were children.